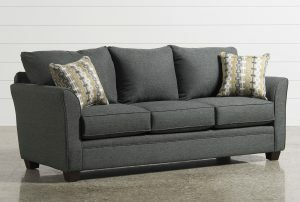 Buying a sofa is a long-term investment, and you want it to remain comfortable for years. This is why the actual filling that goes into your sofa is as or more important than the color and style. Sofa cushion filling is usually polyester, foam or feathers. Foam is the most common filling in couches. The foam seat comes in a variety of densities, with higher density foam providing a firm supportive seating. The good part of high-density foam is its durability. Some prefer medium density foam for its softness, but it will not last as long. If comfort is a priority, then feather filling is the way to go. The typical feather is either duck or poultry. Down is the soft underbelly of Geese. Because of the extra comfort, Feather and Down filling is much more expensive. Also, they do not dry if they get wet, so it’s a good idea to get a protector or use waterproof covers. For those on a budget, the polyester filling is a good option. There are several densities, and all of them are relatively inexpensive. There is also more comfort with polyester fibers compared to foam, and it’s good for those with allergies to feather filling. The Foam Factory Inc. is a specialized store in various foam products including foam inserts.